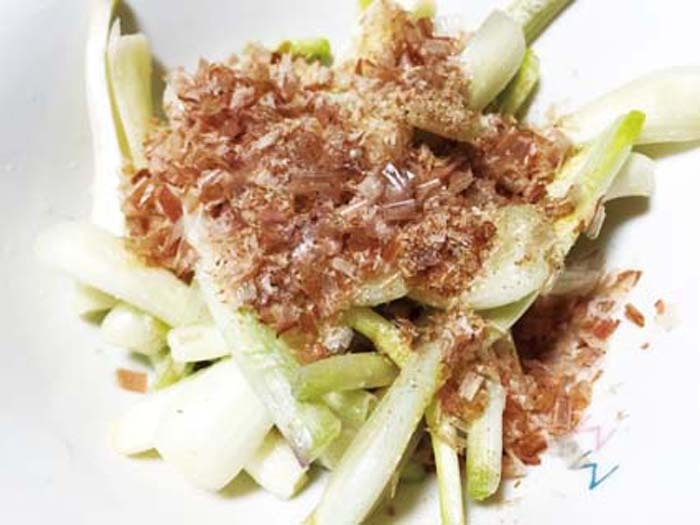 The vegetable of the season this month is ‘Shima rakkyo,’ a variety of scallion that is grown in Okinawa. Shima rakkyo, called ‘racchou’ or ‘dacchou’ in Okinawa dialect, is harvested from March through April. Shima rakkyo is a little different from the scallion called ‘rekkyo’ in mainland Japan. It’s longer and thinner and has stronger, more pungent smell. Okinawan people like to eat it salted or as tempura. It’s regarded as a good match to beer and alcoholic drinks. Wash shima rakkyo and peel off its thin skin. Put the raw shima rakkyo and salt in a bag and shake. Let stand overnight in a refrigerator before serving cold. Adding dried bonito flakes (kazuobushi) reduces pungency.